One of the absolute joys of our sport is the ability to go fast. Faaaast. Those moments where you feel yourself hurtling along the surface of the water faster than you’ve ever done before is hard to describe, and although only momentary, makes all that hard training utterly and completely worth it. But why should you have to wait until competition time to experience what it is like to swim at ultra rad speeds? 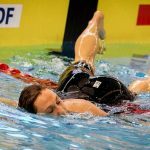 While we might perform a fair amount of swimming at close to race pace, we rarely ever get as fast in our swim practices as we do at a meet in something like the 50m freestyle. As a result, some of the mechanics feel a little awkward when we dive into the water and unleash some of that white-hot velocity. Most notably, I find that swimmers have a hard time with clean breakouts, breathing at high speed, and turns. 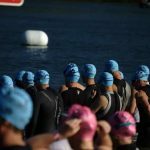 The swimming itself will go great but these critical parts of the race feel awfully unfamiliar because we aren’t used to them. These tips are all about getting you used to the stuff that will happen in your race, so that you won’t find yourself getting thrown off your game plan or getting blindsided. 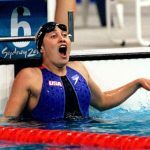 Experienced swimmers and coaches know that working on their dives is a season long endeavor, not just something you do in the days and weeks before a big meet. The dive and breakout should be worked on consistently so that when it comes to race time there are no surprises. 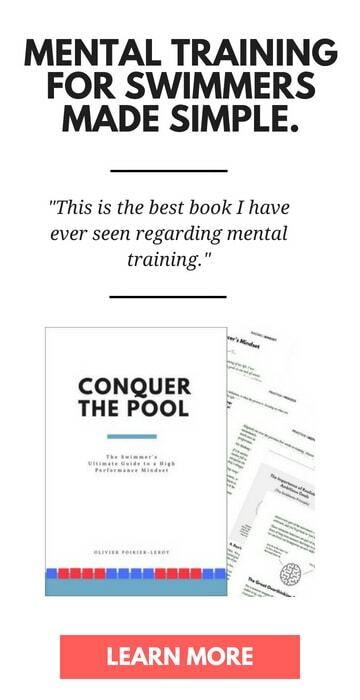 I remember training for a couple months and getting so used to the more shallow breakouts that come with pushing off the wall that I felt myself scrambling to add a couple dolphin kicks off my dive because of the added depth. 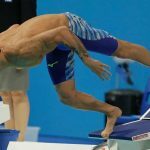 Short of adding a heap of dives to your workout (and not all pools are blessed with the official blocks with the foot chock, while others don’t have starting blocks at all), one way to acclimatize yourself to the deeper breakouts that happen with diving is to simply sink deeper when you push off. This works particularly well in pools that have a deep end, where you can sink down 5-8 feet and then push off fast at a depth more akin to what you would hit when diving in. 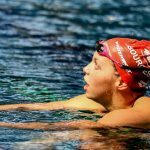 For those swimmers who consider themselves “meet” swimmers—they swim unthinkably faster at meets than training would suggest—this can be a bit of an issue. Not used to the big waves they are creating, the first time they take a breath they find themselves trying to inhale a big breath through a wall of water. Remedy this by breathing at speed. Using fins is one option, and so is some good old rubber tubing pulled by a teammate or coach. Breathe as you would during your race so that you get used to ducking your mouth above that wall of water to draw oxygen in. 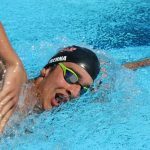 Last summer in the 100m freestyle at the Phillips 66 Summer National Championships in Irvine the greatest swimmer in the history of the sport performed what was altogether an age grouper mistake. In the final of the 100m freestyle—alongside fellow Olympians Nathan Adrian, Anthony Ervin and Ryan Lochte, Michael Phelps charged into the 50m wall, looking to have a monstrous back half and make ground on the early sprinters. Instead, he misjudged the wall, pushing off with the tips of his toes. Without the momentum from the turn and Phelps’ strong dolphin kick and breakout he was left in the dust, placing second to last. 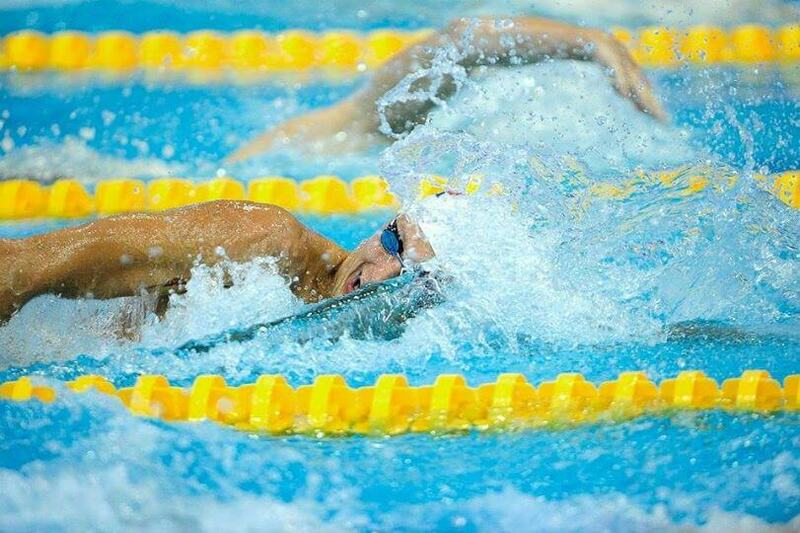 Not having done very many turns at race pace (or having done any turn work at the pool in order to get used to his surroundings) Phelps found himself in the uncharacteristic position of being unfamiliar with turning at high speed. 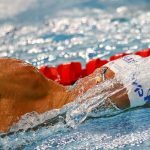 What can we learn from Phelps’ gaffe? Being comfortable turning at speed is critical, especially in those high pressure moments. Dive from the side of the pool about 7-8 meters away from the wall, and sprint into the wall and execute what is essentially a race pace turn. A favorite set of mine is to do a set of 50’s (in a short course pool, obviously) and to sprint the middle 25m. So you would cruse 12.5m, build up to a sprint and do a turn at full speed, explode off the wall to the 12.5m mark and then cruise the remainder of the 50. Attack your walls regularly. The fastest way to improve your turns is to attack them in practice. As I outline in this post, we slow down into the walls–often without noticing it. Faster turns means overriding the brake-pumping we naturally do when heading into the walls. 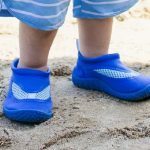 Throwing on a pair of swim fins is another option, although I have always found it difficult to get a good plant and push off while wearing Zoomers or fins. So there you have it, three simple ways that you can get used to performing at high speed in practice so that there aren’t any surprises when it matters most. Give one of them a try at your next practice and let me know how it goes.